You can set the vectorization style you want to apply to the subsequent drawings that will be sent to the Vectorize Queue in the Control Centre, using the Vectorize Style command. 1. Select Edit >Vectorize Style. 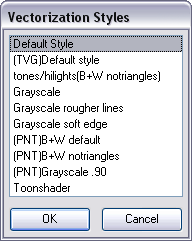 The Vectorization Styles dialog box opens. 2. Select the desired vectorization style from the list. Refer to the Harmony Stage User Guide to learn how to edit and setup the vectorization styles. Refer to the Harmony Server User Guide to learn more about the Vectorize Queue and the Control Centre.